Owner Jon Schmelz, Sr. wanted a product that matched the Volkswagen image and one that would hold up to the demands of his busy Metro car show room. An upcoming visit by corporate executives from Germany added urgency to Jon’s remodel. 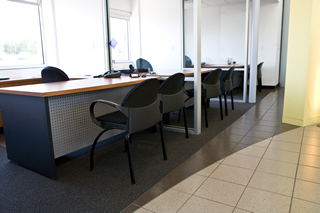 Jon requested the installations to be completed in phases to allow the showroom to stay operational and the entire project completed, if possible, by the time the corporate executives arrived. 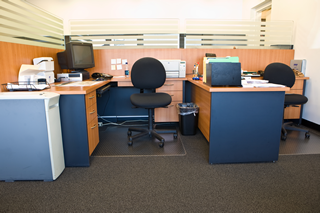 Jon also needed the accounting area’s office furniture to be taken apart and removed, the carpeting installed and the furniture reassembled off-hours so as not to hinder service to his customers. Design and Product Selection: CBL’s Frank recommended a carpet with sleek blends of charcoal in a level loop construction that fit Jon’s needs and complemented the Volkswagen image nicely. CBL completed work in the showroom in sections during operation hours, while work in the offices, reception area and accounting area were completed after hours. A great amount of furniture had to be disassembled and removed for the installation, so detailed diagrams with precise measurements were created for the office furniture to ensure that they were re-assembled and placed back correctly.